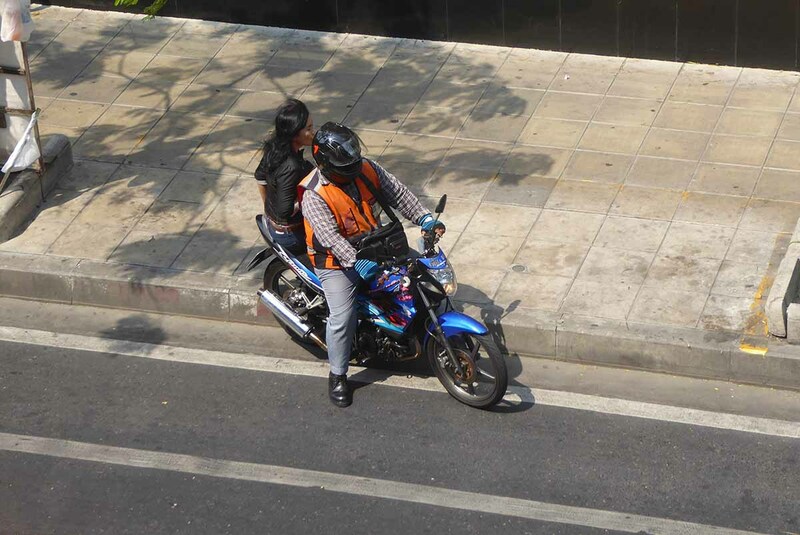 A Bangkok Motorcycle taxi is the fastest way to get around the city’s roads but also the most dangerous, weaving in and out of traffic. They are easy to spot in their distinctive mostly orange jackets. You can hail them on the street or at their home stations, usually outside MRT/BTS Skytrain stations, office buildings, malls, and at the end of Soi’s (side streets). You must negotiate the fare with the driver as fares are not always fixed. Sometimes there is a fare board with fixed fares but it’s usually written in Thai only. BTS/MRT are usually written in English. This is not the cheapest way to get around unless you’re going a very short distance. Fares start at around 10 baht and depend on the distance but usually works out about 40 baht a kilometer. You should always ask the driver for a helmet though don’t expect a clean shiny one. There is a 500 -1000 baht fine for not wearing one if you’re stopped by the police. Always hold on to the grip at the back of the bike. Keep, your knees tucked in, don’t lean back and keep your feet on the foot pegs.